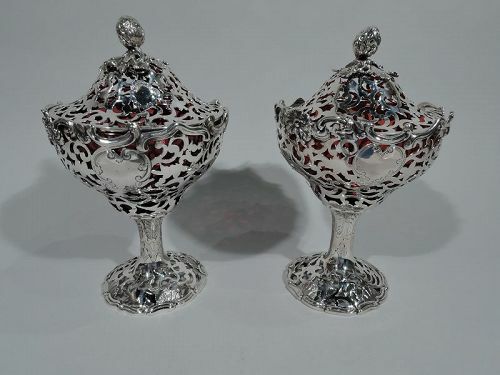 Pair of Edwardian sterling silver and crystal compotes. Made by Gorham in Providence, ca 1910. 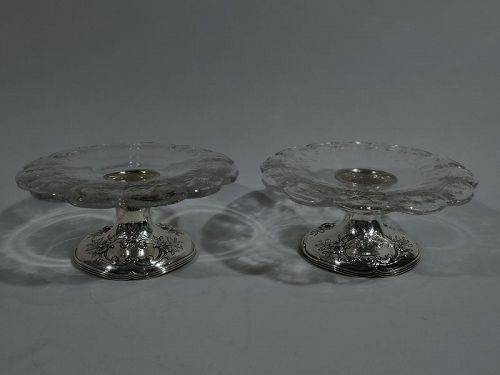 Each: Shallow clear crystal bowl with etched flowers and gently turned-down scalloped rim mounted to raised foot with chased flowers and reeded and lobed foot. 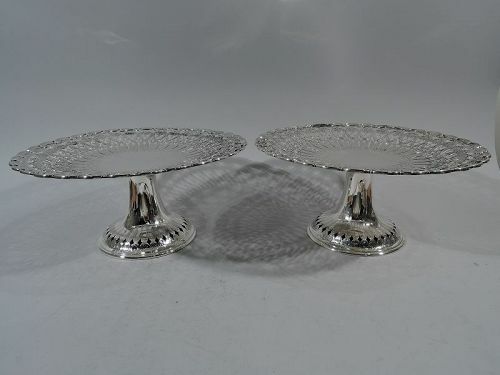 Pretty pieces for serving or display. Crystal very heavy. Fully marked including maker’s stamp and letters FLM. Very good condition. 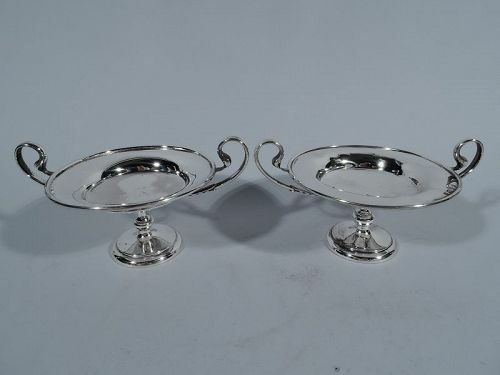 Classical sterling silver bird bath compote. 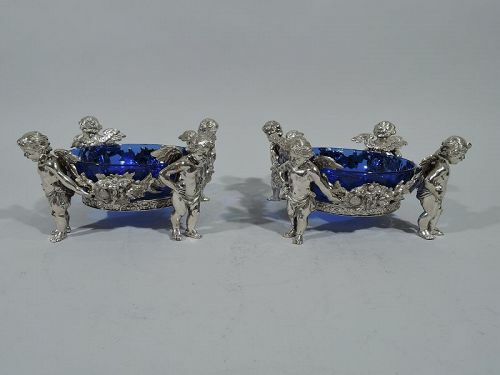 Made by Tiffany & Co. in New York. Shallow bowl with turned-down rim and raised foot. Two cast bird figures with voluminous plumage and flamboyant crowns perch on bowl rim, ready to cluck and flap and flutter. Stylized and raised ornament on rim, including leaf-and-dart and dentil. Fully marked with pre-1875 pattern no. 3739 and directors’ letter M (1873-91). Very good condition with deep patina. 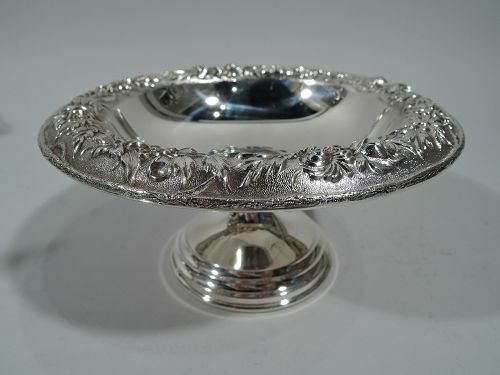 Old fashioned sterling silver compote. Made by S. Kirk & Son in Baltimore. 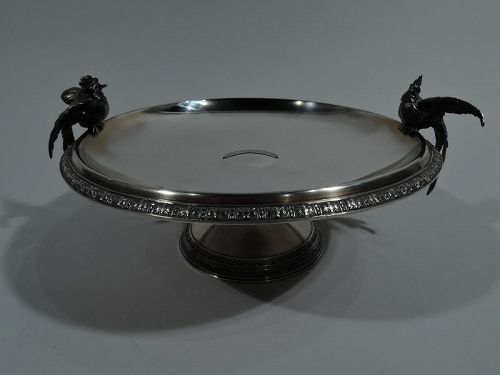 Deep round bowl with curved rim, spool support, and stepped round foot. 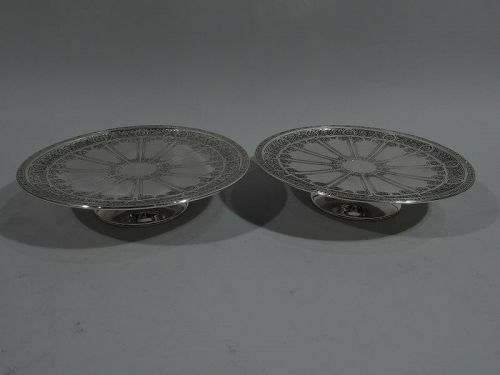 Rim has repousse floral garland on stippled ground. Hallmark (1932-61). Number 436. Very good condition. 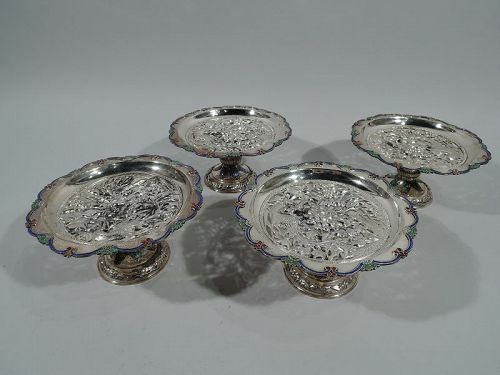 Set of 4 Southeast Asian export silver compotes, ca 1920. 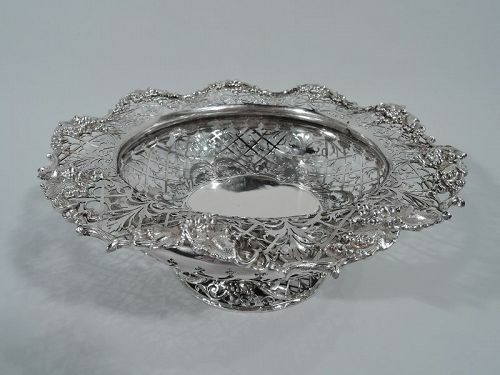 Each: Shallow bowl with pierced and chased birds and flowers. Enameled rim with raised scallops interspersed with berries and leaves. Support has ribbed knop. Foot raised with applied foliate medallions with polychrome enamel. Foot rim encircled with animals scurrying along leafing branch (also applied). Striking and unusual. Hallmarked. Very good condition. 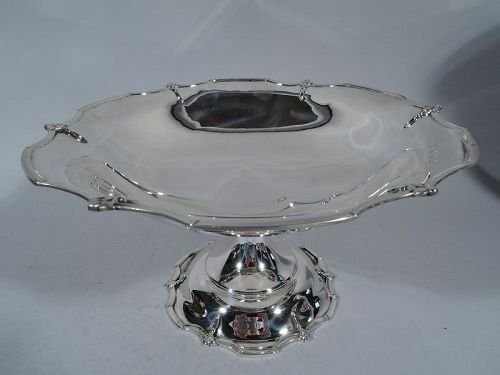 George VI sterling silver compote. Made by Barker Bros in Birmingham in 1940. Bowl on raised foot. 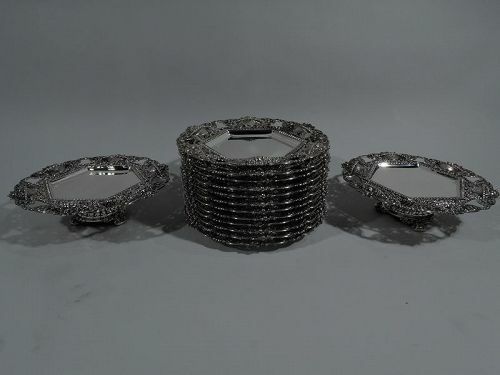 Curvilinear rims with applied stylized flowers. Pretty and old fashioned. Hallmark includes French import mark. Nice condition and patina.